– thus the Google characterises the land of proud Polacks. For a Pole, this definition hurts more than the three partitions of his country. Why do they stop at Poland, he’d cry out. Instead of “England is a European country on an island in the North Sea, known for its Jamaican Rastas”? I commiserate with you, my Polish friends. It is very demeaning to be known not for the deeds of your ancestors, nor for mighty sword of Jan Sobieski that saved Vienna for Christendom, nor for the star lore of Copernicus, neither for the gentle muse of Mickiewicz and Chopin, but for something quite marginal for your culture and history, at least as marginal as Rastafarians are for the Brits. The Russians and the Germans partitioned your lands thrice, but they didn’t think your only claim to fame is that you were hospitable towards Jews. This very Jewish attitude is typical for America in our days, for the US has become more Jewish than Poland ever was. And they are repaid for your hospitality with a mean coin. Jews lived in the Polish lands for centuries, and lived very well, until they moved to new pastures – to America, to Germany, to Russia, to Israel. My father was a Polish citizen, and he cherished his memories of the land and its folk, and so felt other Jews of his generation. However, organised Jewry had different ideas. The conflict between the Jews and Poland began with anti-Polish publications in the US media a few years ago. The Jews began to goad Poland. They reminisced about Polish clashes with Jews in the 1930s and 1940s, not exactly a unique Polish story. Many nations have clashed with Jews, lately the people of Gaza. The last anti-Jewish riot, or pogrom, in Europe took place in England in 1947, not in Poland, and was caused not by some pathological, illogical, irrational hatred of the Other, but by the Jews’ heinous act: they murdered two English soldiers, hanged their bodies on a tree and booby-trapped these with a landmine. However, the Jews do not choose to recall those British riots, they are forever reciting Polish troubles. They said the Nazi concentration camps were built in Poland because Poles sympathised with the Nazi plans to eliminate the Jews. More and more often they referred to “Polish concentration camps” (instead of Nazi concentration camps in Poland), heavily implying Polish complicity in the Holocaust. The Poles responded to this salvo of abuse by passing a law forbidding anyone of accusing them of collaboration with the Nazis under penalty of imprisonment. The Jews were furious and called for knowingly breaking the law by shouting “Polish Holocaust!”. (It is worth watching this short video in order to feel their fury). There was a practical reason, as well as a discursive one. By putting pressure on the Poles, the Jewish organisations followed the blueprint they had utilised against the Swiss with great success. Although known Jewish assets in Swiss banks were quite small, the Swiss gave in under pressure and paid billions of dollars to the Jewish organisations. Now a similar extortion racket has been planned against Poland. This was the practical reason, while the needs of their battle for discourse called upon the Jews to safeguard their copyright, i.e. to keep in their hands the authority to decide and rule what is the Holocaust and who is guilty of it. The Polish example could be followed by the Americans and the British who may become tired of being accused of failing to bomb the railways leading to concentration camps. Indeed Donald Trump already tried to speak of millions of non-Jewish “victims of the Holocaust”. Rebellious Poland had to be suppressed. Organised Jewry called upon Poland to restore to them all the property that belonged to individual Jews in Poland before the WWII. Though Jews were a small minority, they were a very prosperous minority, and many Jews owned a lot of property. They owned it as private Polish citizens, naturally. In the Communist period, many Polish properties were nationalised, whatever their owner’s faith was, Jewish, Catholic or even Buddhist. However, the 1960 treaty between the United States and Poland solved this problem. Poland compensated American nationals whose assets had been nationalized by the Polish government and the United States indemnified Poland from any additional claims and compensation demands. Now they have decided to re-open the case by claiming properties that belonged to Jewish owners who died leaving no heirs. If an owner dies intestate, his estate goes to the state. This is the basic rule all over the world, and Polish Jews are no exception. If a Polish citizen, a Jan or a Moses (or even an Ahmed) dies intestate, his property in Poland goes to Polish state. The Jews want to change it. They say intestate property of private Jewish Polish citizens should revert to Jewish ownership, actually to Jewish-American organisations. 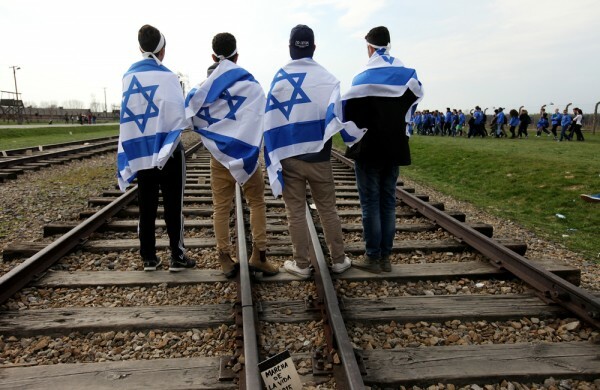 These bodies have already pocketed billions of dollars’ worth of German funds; this money pays handsome salaries to Jewish officials; it builds Holocaust memorials and museums, and allows Jews to fight numerous legal cases strengthening their hegemony. Now they want to shake Poland down for a cool $300 billion, 60% of the country’s GNP. It will certainly allow many Jewish functionaries to live in a style to which they are accustomed. The US supported this claim, and a few days ago, S. 447, the “Justice for Uncompensated Survivors Today (JUST) Act of 2017,” became law, as President Trump signed it after the House of Representatives and the Senate duly voted for it in bipartisan solidarity. Now the Poles can’t just disregard these claims. They have to transfer every asset that ever belonged to a Jew into the hands of American Jewish organisations. If and when a similar law would be enforced in the US, American Jewish organisations would inherit from Chomsky and Unz, me and Gilad Atzmon, the Amazon and Soros Fund. This is patently crazy: just in a few years, Jewish organisations will become richer than Rothschild and Rockefeller ever were. The Jewish organisations collecting the tribute are also very rich. They have a dirty history of fraud with dozens of convictions; they spend much more money on their own salaries than on needy survivors. Norman Finkelstein wrote a well-known book, The Holocaust Industry, full of strong critique and indignation, about the Holocaust Lords with their half-a-million-dollar-a-year salaries and great hotels to hold conferences. I would prefer they’d spend all their ill-gotten wealth on their salaries and hotels, because they use whatever is left (and we are speaking of billions of dollars) to restore Jewry and to promote their narrative, to build a Holocaust Museum in every city, to give grants to painters, writers, film directors, media editors. They bribe whole communities. They keep the descendants of Jews together by scholarships, free schools, free meals. And they de-Emancipate the Jews. This freedom of the Jews didn’t last too long: now Jews are on the way to becoming subjects of Jewry, ruled by Jewish-American organisations. They want to retroactively turn all Jews into members of World Jewry, so that their property will remain in Jewish hands if they die intestate. This is a claim of a state, not of a church neither of a community or a diaspora. Thus, above two Jewish polities, Israel and the US of A, a third polity rises, Jewry, a quasi-state, whose existence is often denied, but when it is a question of money, obfuscation is out of place. The US decided, by promulgating Act 447, that a Polish Jew has never been a citizen of Poland; he was a member of Jewry, and his property should revert to Jewry, not to the Goyish Polish state. This is quite an extraordinary claim; perhaps understandable in the Middle Ages, when Jewry formed a separate estate, but nowadays it is a recognition sign of the Jewish Messianic era. This is the end of Enlightenment, and Jews, liberal or conservative, have been transformed from free persons and citizens of their countries into subjects of Jewry. This is done without Jewish consent. Ordinary or extraordinary Jews did not agree, didn’t vote, didn’t express their agreement in any way for this turn of events. I write these lines with Philip Roth’s recent demise on my mind. Jewry would collect his spiritual and material legacy – and that’s despite his last will to keep his burial free from any Jewish religious ceremony, despite the fact that he hated to be called “a Jewish writer,” insisting that he was an American writer. It didn’t begin today – Germany already recognized Jewry (or the world Jews) as a subject of international law: “The Conference on Jewish Material Claims Against Germany, or Claims Conference, represents the World Jews in negotiating for compensation and restitution for victims of Nazi persecution and their heirs”. Now it has come to Poland, and afterwards, there is a list of forty countries they intend to flay, from Estonia to Morocco. They all will have to recognize that their Jewish citizens were, in effect, foreigners, members of a foreign body. Otherwise, they will find themselves on the black list of the US administration. This is an ironic turn of events for Poland. Poland is the most pro-American and anti-Russian country in Europe. In Poland, there are American tanks and American bases, and American missile launchers; Poland is the gate to the East and the forward base of the Empire. In case of a hot war with Russia, Poland will be the most necessary link in the Western chain of command. The Poles even chopped off the old oaks of the primeval Białowieża Forest on the Belarus border to open the way eastwards for American tanks (they provided this or that other explanation). Jewish Lobby greed and the complacency of American political class may yet achieve what Putin’s efforts failed to do. Everyone can be betrayed once, but Poland has been betrayed so many times that the Poles should check their settings. Poland has no future as the forward base against Moscow, but this understanding hasn’t seeped into the Poles’ mind yet. In polite society, it is acceptable to refer to the “Israel Lobby”; however, the JUST Law has nothing to do with Israel. The force successfully pushing for it, is the Jewish Lobby, plain and undeniable. The Poland-fleecing law answers the old question, do US Imperial interests and those of the US Jewish Lobby coincide? Destroying Iraq and Syria and supporting Saudis was in Israeli interests, sure, but one could argue about whether it was in American interests or not. Now we have a rare clear-cut case where American Jewish Lobby acted against American “Imperial interests” and the whole of the American political establishment accepted the demand of the Lobby, turning the superpower into the mightiest enforcer for the Jews. (Warning: If you have strong aversion to religious and spiritual discussions, skip this part). Why do I speak of the Jewish Messiah? Who is he? I wrote about it at length in the book called Pardes. The Messiah for Jews is not a person, but a spiritual force. It is the spirit of Jewry. I called it Jewry – Yizrael, as opposed to Israel. Yizrael is his own Messiah, this is the view of Jewish Cabbalists. The Jewish Messiah, the spirit of Yisrael makes the world perfect for himself. And now we are entering the period of his dominion. When he will sit in the Temple on the Mount Moriah, his dominion will become perfect – not necessarily wonderful for individual Jews and even less so for individual Gentiles. The prophecy says he will be overthrown and replaced by Christ, or the Christian Messiah, the True Saviour and God. For this reason the Jewish Messiah is called the Anti-Christ, or the Ante-Christ, the one who comes before (like in antipasti or ante meridiem) and against Christ. While the Jewish Messiah is the anti-Christ, Christ is anti-Semite. Meaning not only “against”, but “before” as well, for Christ is connected with Melchizedek, being “a priest forever in the order of Melchizedek” (Ps. 110:4), and Melchizedek preceded Israel, for he is a son of Adam. This title, the Son of Adam, The Son of Man is a title of Christ, the True Messiah, while Jewish Messiah claims the title of the Son of Abraham and the Son of Israel. Jewry denies Christ, this is the existential meaning of its existence. While many Jews of Jesus’s days followed Him into Israel, that is the Church, another part, Yizrael, or Jewry, fought Him, caused His death, and continued the battle with Him after His resurrection. Now Yisrael is victorious, though prophecy says he will be defeated by Israel and Christ. Jews deny that Melchizedek is anti-Semite: they say he IS Shem, the first Semite, and that he surrendered his priesthood to Abraham and eventually to Aaron. In Christian view I share, Melchizedek did not surrender his priesthood, he received tribute of Abraham, and blessed him, but his elder priesthood and descent from Adam was not diminished. I discussed elsewhere the Jewish claim that only they are Adam, i.e. fully human children of the First Man. This is a false claim and the source and reason of Yisrael’s rebellion against God and His Christ. All of us, not only Jews, are fully human children of the First Man and more than that by virtue of receiving communion of blood and body of Christ. The Rise of the Jewish Anti-Christ had been foretold; still it is amazing that we witness this development. I thought that is an allegory, a parable, a fable; but it is as real as a cup of tea. They supported Napoleon’s invasion of Russia. They refused Russian pre-WWII offers of alliance against Hitler. Instead, in January 1934, they allied with Hitler against Russia, and in 1938, they joined in Hitler’s dismemberment of Czechoslovakia, blocking Russia’s plans to save the Czechs. Afterwards, they allied with England and France, but in any case against Russia. Even in August 1939, Poland was adamant against receiving any Russian help that could stop Hitler’s invasion. England and France declared war on Hitler when he invaded Poland, but it was the Phoney War. They did nothing to save Poland. They bled the Poles at Monte Cassino. The West pushed the Poles to rise against Germans in 1944, hoping to re-establish anti-Russian Poland once again, but did nothing when the rebels bled to death. (Well, not exactly nothing: they complained why Russian soldiers do not want to die for them). In 1945, the Western Allies agreed with Russian dominion in Poland.